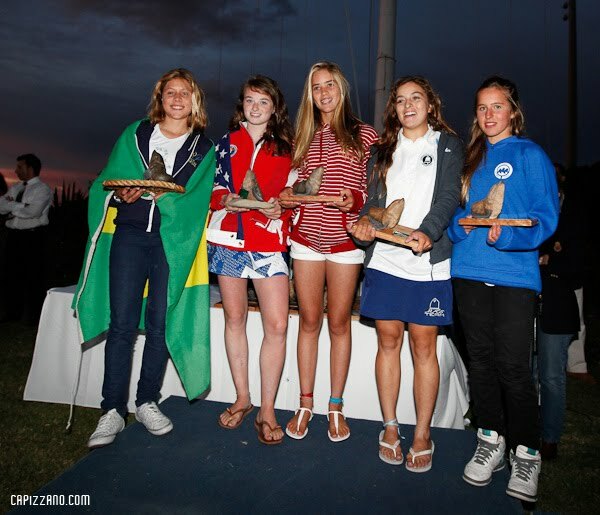 Congratulations to our three LISOT sailors, Harry, Malcolm, Megan, who were members of Team USA at the 2010 Opti South American's last week in Punta del Este, Uruguay. The trio "gave" by donating sails to Paraguay and El Salvador, and "got" by bringing home Gold and Silver (full results). The US won the Gold Medal at the Nations Cup Team Race. Harry Koeppel (below, 2nd from left) and Malcolm Lamphere (2nd from right) were members of the winning USA Team 1. They beat USA Team 3 in the finals. Megan Grapengeter-Rudnick (below, 2nd from left) was awarded the Womans Vice Champion award for finishing 2nd girl overall. Megan was also the #2 US sailor. 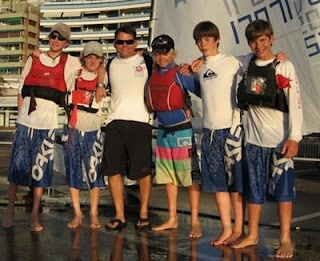 And Team USA donated sails to Paraguay and El Salvador to help support new Opti programs in those two countries. Team USA was recognized for this by IODA.